Sinus infections affect more than 37 million people a year in the United States, according to the National Institute of Allergy and Infectious Disease. For those who prefer natural remedies for treating sinusitis and other sinus conditions, this may be a good choice. Recently, scientists have studied and reported results supporting the use of these natural antimicrobial plants. Herbal antiseptics and antibiotics are milder than their pharmaceutical or over-the-counter counterparts, which makes using them for minor illnesses a logical option. The formula contains Bayberry Bark extract which is an effective way to help treat signs and symptoms of a sinus infection. The herb stimulates the circulatory system, aiding the body in expelling excess mucus from the sinus cavity. Bayberry Bark herbal extract is used to treat and help relieve the sinus symptoms of colds, virus, and overactive mucous membranes and makes an excellent herbal nasal astringent that shrinks and dries secretions. Bayberry bark also provides a heating sensation when applied to the skin which will help loosen up thick mucus buildup as well as relieve sinus pressure, tenderness, and congestion. Bayberry contains a natural antibiotic which clears nasal congestion while killing off the infection causing the sinusitis. Goldenseal's properties as both an anti-infective and mucous membrane anti-inflammatory may be helpful in easing sinusitis symptoms and improving the healing process. It is especially effective when used in a warm sinus irrigating solution, such as this combination. It loosens and washes away the thickened, infected mucus that can cling to the walls of sinus cavities. Myrrh gum herbal liquid extract achieves its antimicrobial action by stimulating the production of white blood corpuscles and also by its direct antimicrobial effect, it is effective in the treatment of fungal and viral infections. It also works to strengthen the immune system. Myrrh, or Gugal gum, liquid extract is of great value in the treatment of sinusitis and for relieving sinus pressure. 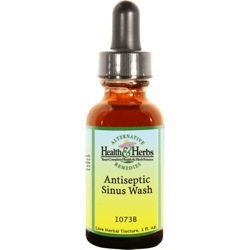 Natural remedies for sinuses, like sinus rinsing, are quite effective, and by adding colloidal silver, another natural antibiotic, to the rinsing procedure can make it much more powerful. Colloidal Silver consists of tiny particles of this natural soft elemental metal suspended in pure water. Colloidal silver has been used to treat sinus infections because the substance is known to act equally well on infections caused by either fungi or viruses. Ingredients: Bayberry Root Bark, Goldenseal Root, Myrrh Gum, Colloidal Silver Water, 20% Alcohol. Instructions: Shake well. Use 6 drops of this tincture and dilute in 1/4 cup of hot water. Let sit until warm. Then use a Neti pot to rinse out your sinus cavities by tilting your head back and to the side. You can also use a dropper. You may also add 1/8 teaspoon of sea salt to this mixture at the same time as you add the hot water for a 2nd flushing. From Silicon Valley of San Jose, California on 10/15/2013 .